Before I washed my face tonight, I noticed something strange in the mirror (it wasn't my face, I've grown quite used to that now), it was the fact that my eyeliner was exactly where I left it this morning - on my eyes. I'm such a massive advocate of the winged-liquid-eyeliner-look that I've forgotten the last time I went without it. Subsequently, I've tried many different brands, gels, liquids and felt tips to achieve that lovely cat eyed look. Most of the liners I've tried have been good, some have been tragic, but this one has to be my favourite to date, thanks to its glossy finish and awesome staying power. My eyes 12 hours after application! I actually bought this a few months ago and always thought it was good, but tonight I was compelled to write about it because it survived a fairly active day at work! I like how shiny it is (much like a moth, I'm attracted to shiny things) and the fact that you can use it to create wafer thin, subtle lines, or thick and dramatic statement flicks. The only issue I have with this product is that the tip is a little long and bendy, which can sometimes be a bit difficult for me to control enough to get a precision flick. I'm sure those of you with steadier hands than mine won't have a problem though! 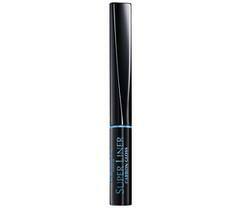 I'd love to know if anyone else has tried the Super Liner? What did you think of it? aaah my first reply didnt push through. anyway i tried to share that i used that liner i think early last yr (or late 2010) and i remember loving it a lot! i love the foam applicator :D very easy to work with! and very precise! Looks good! I never tried it before.